I have loved this oil painting, which hangs at the State Hermitage Museum in Saint Petersburg, and the Nouwen book about the painting for a long time. Painted sometime during the final two years of Rembrandt’s life before his death in 1669, this work challenges us to remember that the father never gave up on his wayward son. In keeping with KRMC's current Lenten worship theme, Deadly Scripts & Living Story, this story qualifies as life-giving. Last week I listened on YouTube to a 2012 lecture by Sister Sue Mosteller, trustee and literary executrix of the Henri Nouwen Legacy Trust, as she spoke of the painting, her friendship with Nouwen, and the book. Below is a brief synopsis of her sharing, influenced as well by my reading of fine art conservator Helen De Borchgrave’s A Journey into Christian Art. Nouwen found in the familiar Bible story of the father and his two sons major themes from his own life and work. When he first spotted a small poster depicting the painting of the father embracing his younger son, Nouwen, also an elder son, resonated deeply with what he saw and recognized in himself characteristics of both sons as portrayed in the parable. A friend said, “You talk about yourself being the older and younger sons, but you are called to be the father,” the father who plans a party and rejoices mightily on his wayward son’s return, the father who welcomes his son back without question or criticism. Mosteller, who says she learned from Nouwen how to “step into the painting and begin to walk around and identify with the characters,” suggests thinking of yourself as the younger son, the older son, the father as you spend time with the painting. The younger son, a normal adolescent who longed for freedom and money and insulted his father by asking for his inheritance before his father’s death, wandered off and squandered his inheritance. He didn’t really know his father, sought pleasure ahead of relationship, and found himself farther and farther away until he eventually lost his money, his friends, his job. When he came to his senses, he decided to go home as a servant, contemplating what he might say to his father on his return. How are you like the younger son? Have you experienced the love of someone who offers nothing but welcome on your return? The elder son, the tall figure standing off to the right of the painting, stayed at home, appearing to be dutiful, though inside he was shut down, judgmental, angry at his father, perhaps also wishing that his father were dead. In his own way, the elder son also strayed farther and farther from the truth of being a beloved son. Though he did not physically leave home, he became emotionally absent. Nouwen identified deeply with the plight of the older brother, who made an angry speech when his father invited him to the younger son’s homecoming. “You kill the fatted calf for this son who has chewed up his inheritance?” For the elder son, Nouwen observed, it is so much easier to continue asking “Do you love me?” rather than saying “Yes” to being the beloved. Can you relate to the elder son’s thinking? The parable, as illustrated in the Rembrandt painting, invites us to view ourselves as beloved children. Like the younger son, we will leave and return from time to time but the Giver of Life sees each of us as beloved, held safely by everlasting love, even in our mistakes. 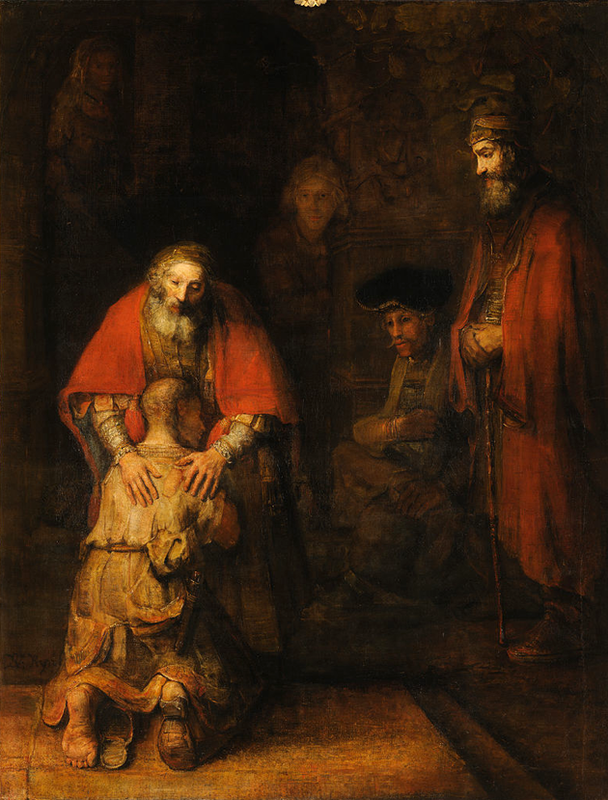 The Father yearns for us to accept the love and claim our inheritance, the Rembrandt painting reveals. How do you identify with the father’s generous treatment of his younger son? Consider the times and places you have been the recipient of abundant, unconditional love. Have you also offered abundant, unconditional love? How is God calling you to faithfulness and reconciliation this Lenten season? Remind yourself that God waits as long as it takes for us to receive Divine love and find ourselves in the process.